It’s no secret that Arithmetic Village was inspired by an encounter with a waldorf math gnome during my search for the perfect school for my eldest daughter. 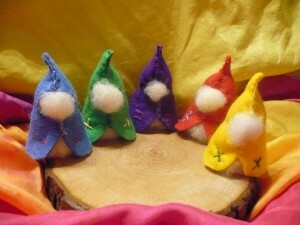 While I was touring the East Bay Waldorf school in California I saw a chalkboard poem about a gnome, “Plus”. Just a simple poem. This was it! The missing piece of imagination in math that I had been looking for since I was a child and again when I was a teacher. I could not believe that this approach existed and was known to so few. So I researched and researched. It was 1999, before facebook, pintrest, and twitter. All I could find was Bob and Nancy’s Waldorf supply sight. If there was Information about math gnomes, it was buried deep in an expensive and comprehensive waldorf teaching manual, completely inaccessible to non-waldorf teachers. My plan was two -fold. One- to create a program using similar methods- personification, rhyme, color association for my daughter. Two- to ensure all children (not just Waldorf educated children) also had this creative option available. Years were spent, pondering and planning, the colors and temperaments carefully chosen. I wrote and re-wrote the poems. I chose to make longer poems with examples, but not too long as to keep the spirit light-hearted. The books are intentionally positive, simple, and classic. The addition of a dog for the king was created to introduce the concept of remainder. There is no need for an equals gnome as the castle’s drawbridge and rules serve that purpose simply. Arithmetic Village was created with the intention not to copy the Waldorf Gnomes, but to make their inspiration more accessible to the masses. It is a program that has brewed with me for over a decade and is presented to the world with great love. I hope you and your children enjoy Arithmetic Village as much as I do. If you do, please spread the with your friends and family!